shrine in all of Asia. During the Colonial Era, when Rudyard Kipling sailed up the Yangon River, he wrote of his sighting of the pagoda’s golden dome upon the horizon as his vessel neared the city. That glistening stupa still dominates today, both architecturally and symbolically. 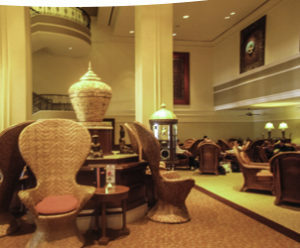 In keeping with that symbolism, a stay at The Strand Hotel carries with it the colonial legacy of legendary literary figures like Kipling, who reputedly penned part of his Jungle Book series during a stay at the hotel. Built at the turn of the century, the three-story Victorian mansion has been restored to its former glory with the added touch of all the modern day conveniences one would expect in a five-star property. Each of the 32 rooms is actually a suite with a separate seating area, antique teak furnishings, comfortable beds with fluffy, thick pillows and spacious bathrooms. The upper two floors are accessed by a grand staircase (elevator optional) and accompanied by impeccable butler service, always accommodating but never intrusive. Rangoon sojourn. If your stay includes a Friday evening, Happy Hour begins at 5 p.m when the draw of half-price drinks and complimentary appetizers creates a merry mingle of local expats and international travelers. Unquestionably, the best breakfast in all of Rangoon is complimentary to guests and served daily at the Strand Café with a full menu that caters to American and Asian palates. House made pastries, fresh squeezed juices, fresh preserves and fruits round out the cooked-to-order choices. Burmese coffee and freshly brewed Ceylon tea along with a copy of the International Herald Tribune add to the experience. 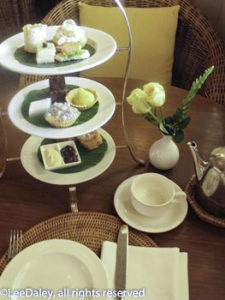 Another taste of the Raj is yours for a pittance with traditional High Tea served every afternoon in the Strand Café. Spacious rattan armchairs and white tablecloth service add to the relaxed elegance of this sumptuous service that at last check was priced at a mere $15. The Strand’s location at the edge of town allows for easy access to all the major sights of the city, either by foot or for by taxi. Taxi fares anywhere in the city are under $3.00. What really sets The Strand apart is the exceptional level of service. Front desk/concierge staff are consistently exceptionally helpful, providing information on walking tours, local excursions, and taxi service. 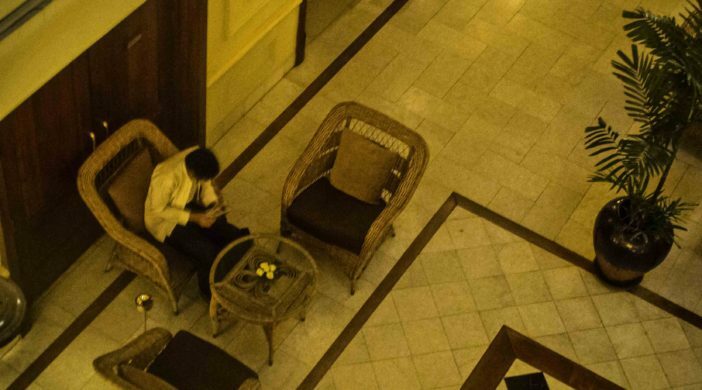 As soon as you enter the hotel’s high-ceilinged lobby with its cool marble floors, ceiling fans and potted palms, you feel a great sense of comfort. A place that still retains the elegance and quirkiness of an older hotel, it exists simply to cater to its guests, whether they be budding Hemingways or weary road warriors looking for an oasis at the end of the day. 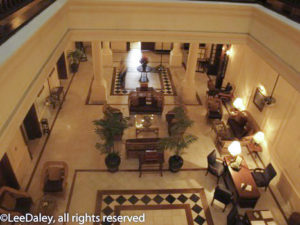 The Strand Hotel is located at 92 Strand Road, Rangoon (Yangon). Tel: (95).1.243.377. From San Francisco, I flew to Bangkok via United Airlines and on to Yangon International Airport via Thai Airways.